Hey congrats on the Pansear! You completed the trio!!! Did you find the Masuda method to be better than the full odds, or do you still prefer full odds. I guess it could be more interesting than just hatching lots of eggs! Regarding my favorite shiny hunting method, it really depends on the Pokemon. 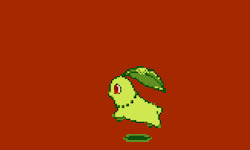 Usually, I prefer full odds, but some Pokemon are difficult to hunt with full-odds methods (like Gible, who has a low encounter rate in all the areas where it can be found, except in the HG/SS Safari Zone using the Repel trick, but shiny hunting in the Safari Zone is risky ; or the 7th generation starters and their very long soft resets), so I would prefer the Masuda method for them (or, for Pokemon like Gible, I could try a full-odds method and then switch to the Masuda method if I don't find my target with the full-odds method). In the case of Pansear's hunt, I didn't want to find another shiny Pansage or Panpour and I don't like the soft resets in the Dreamyard (I tried this method for Panpour before I started hunting at Santalune Forest), so I decided to try a Masuda method. I hope I've answered your question. What is your Sun team? Mine is made up of Primarina, Tsareena, Salazzle, Lycanroc (Midday form), Togedemaru and Kommo-o. They are all females and they don't have nicknames. Last edited by Cleobel; 01-06-2018 at 02:42 PM. Hello everybody! 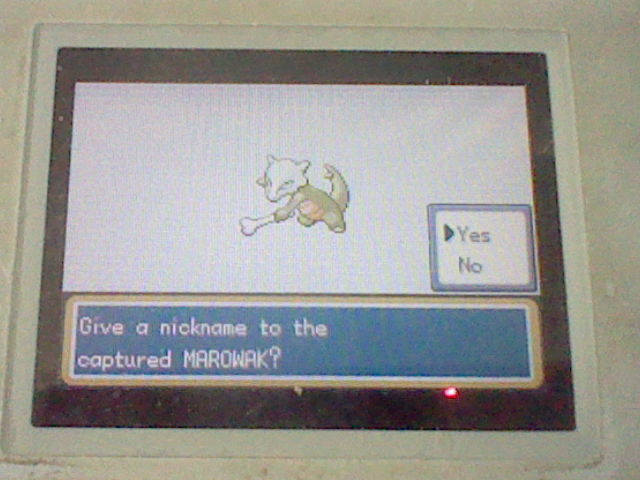 Today, July 25, I found and caught a very special shiny Pokemon in Pokemon Leafgreen : the female Marowak of the Pokemon Tower, Cubone's mother! Ususally, she is uncatchable, but you can catch her using the Pomeg Glitch. The method to catch Cubone's mother depends on the version (Firered or Leafgreen), on the language and on the region of the game on which you want to catch her, and I only know the method for an American Leafgreen version. 15 days ago, on July 10, I was on holiday in Paris and I found an American Leafgreen version in a second-hand video games store, so I bought it to hunt for a shiny Marowak in the Pokemon Tower. 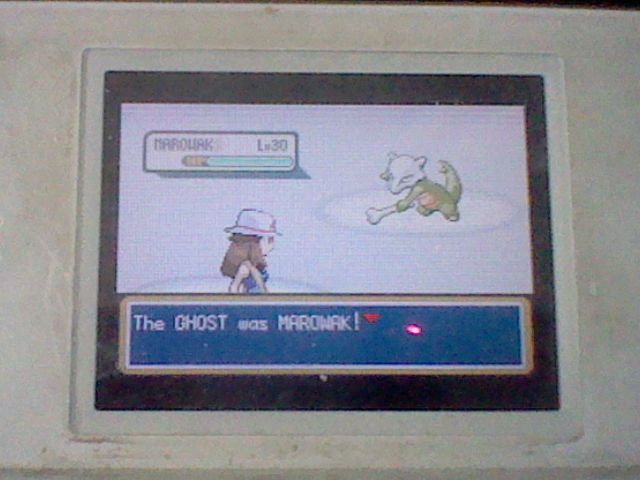 I started the hunt yesterday and I found the green Marowak today after only 197 runaways! 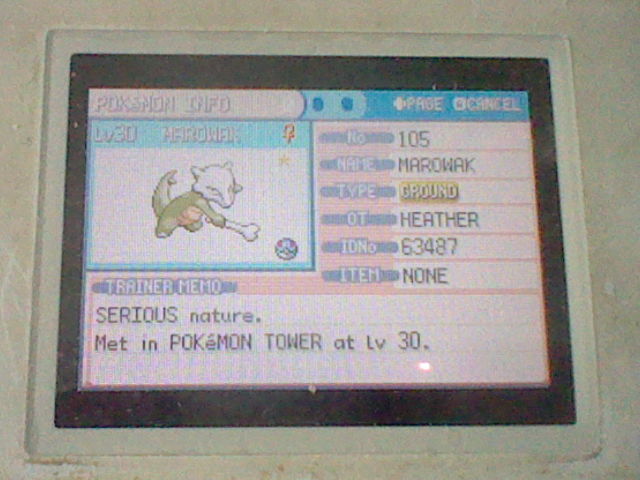 So, I've been very lucky in both finding the cartridge and finding the shiny Marowak! The capture was also easy as the first Great Ball I threw caught Cubone's mother (my Cubone had weakened her with False Swipe and my Butterfree had put her to sleep with Sleep Powder). Her nature is serious (like all Marowaks of the Pokemon Tower), she has 31 IVs in all stats (like all Marowaks of the Pokemon Tower), and she doesn't have a nickname at the moment because I don't have any nickname idea for her. Wow!!! That's so cool! What is the Pomeg glitch?! It's awesome that it has 31 IVs in every stat as well! And interesting, I didn't know it had to be a Serious nature. That's really cool! Congratulations!!! To catch Cubone's mother on my American Leafgreen version, I obtained a glitched Pokemon (a Dewgong) on my Emerald version using the Pomeg glitch, then I traded it to my completed Firered version, and then I sent it to my American Leafgreen version (remember that Firered and Leafgreen can't trade with Hoenn if the Ruby and Sapphire quest hasn't been completed). For some other exploitations of the Pomeg glitch, you have to trade a Pokemon with negative HPs from Emerald to Firered/Leafgreen/Ruby/Sapphire, and to continue the glitch on this version. Last edited by Cleobel; 01-06-2018 at 02:43 PM. I'm so conflicted about this. It's a shiny medititite but it's on a ROM. T.T Anyone know if there's a way to transfer it? If you send me your save file, I can transfer your shiny Meditite to a Pokemon game from the 6th or 7th generation (because there is no more Wi-Fi on the 4th and 5th generations), and then trade it with you. I can do it because I have an R4 card. Really? Now how would I go about sending you my save file? I'd be totally up for it but I'd need to know to do it. Thanks for the help in advance! You can send me your save file by email, Skype or Discord. Don't worry, I've done this kind of transfer a lot of times. Yeah but how do I go about creating the save file to send you?